I was lucky enough to be able to test Svetlana's new pattern for this sweet Anna Pouch. I have already made her Lola pouch and I love how well the patterns are written and the lovely way of finishing the zips with binding. For the flap, I placed the magnet 3/8" from the centre fold and on the outer panel I placed it 1/2" from the top. That's measuring from the edge of the magnet not the centre, which makes it easier! Wonderclips were a big help in the construction, the pouch is only small so they stopped me pricking my fingers with pins! The flap is a nice detail and because I used the folded magnetic closures I preferred to do one row of topstitching on the machine and then did a little hand quilting by hand using perle thread. I found it hard to take pictures that do this little cutie justice, it really is such a pretty bag and the size is perfect for keeping lip balm or any extras you like to carry in your handbag. It would make a perfect gift or little extra in a swap too. You can get the Anna pouch pattern here. It's usually $8 but if you're quick Svetlana has it on sale for $6 right now! The outer fabric is Vintage Cheater Print in red by Atsuko Matsuyuma and the lining is Mirrors and Water, Gossamer by Sharon Holland. I get my zips here. The striped binding fabric and magnetic closure are from Patchfinders. This is my second finish off my Q2 Finish-Along list (it was the number 1 secret project!) and I'm feeling good! That's such a cute little pouch! The hand stitching on the closure is divine! Very cool, you are such a clever sewing artist! 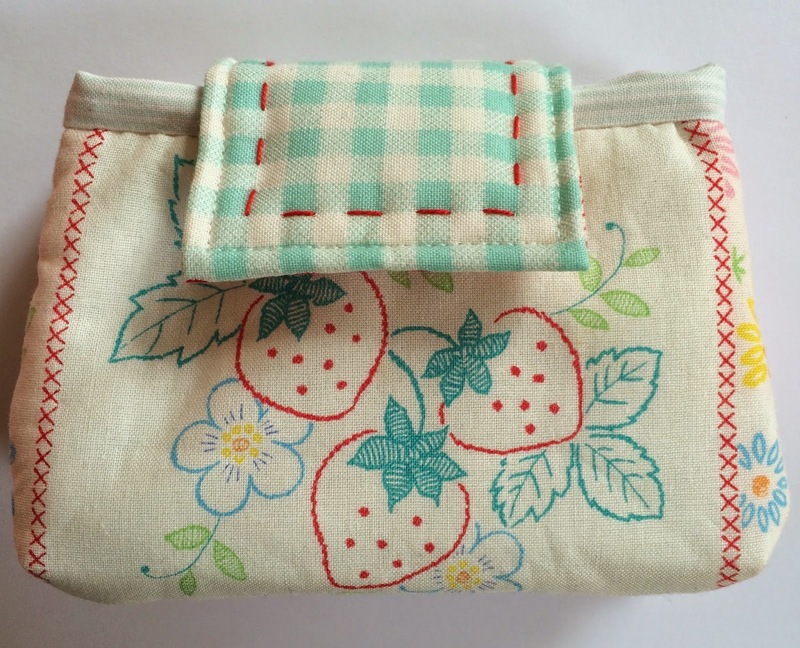 Such a sweet pouch and the fabric you have used is so cute!